Look out introduced in england, in 1957, when american cars were still in the boxy stage, the aston martin was one of the fastest and most elegant automobiles of its day. Double-overhead-cams, a pair of s.u. Carburetors, a tachometer with no redline and an optional tuned exhaust system gave the mark iii 162 hp and a top speed of 120 mph. The car was slowed by new girling discs up front and a finely tuned steering system in the well-appointed cockpit. The mark ills simple design was the result of subtle alterations in the previous model, including the lowering and refining of the grille profile. mission impossible the db 24 mark iii was charged with a delicate mission: To be a successful interim car until the future db 4 was manufactured. It accomplished its task all too well; Some clients preferred the mark iii to the faster and more powerful (and more expensive) db 4, and the cars continued to be made for an extra year. 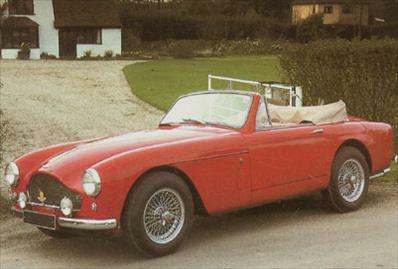 The db 24 mark iii successfully combined the exhilaration of high-speed travel with the comforts of a luxury automobile.